Zensalin's Oblivion Overhaul Is already included in version 1.5 and later. The Skeletons I've seen floating around support Demons wings, or moving dresses, or, bouncing breasts, or something odd, but none have done it all until now. That is what this mod also does. This way if a user chooses to use a moving dress or a bouncing breast or demon wings, or all of the above, they can with one skeleton. 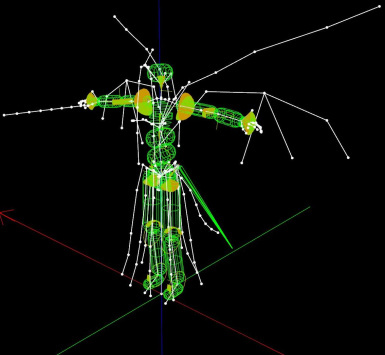 The Skeletons: Game engine skeletons created from the merging of four custome skeletons to allow maximum compatibility between all animations. Includes original skeleton, breast bones, two different wings, clothing, hair, breasts, genetals, and tails. Allows animators to animate all independantly and simultaneously. Allows users to never have to worry about animation incompatibilty based on skeletons. Conflicts: I have only found two conflicts. First is the ragdoll mod which uses a custom skeleton to make dead people drop faster, and a strange mod that make the third person view look cinamatic. I am seeing what I can do to make ragdoll work with this, but the cinamatic one is outa the question right now as it changes the physical location of the skeleton. Other than that NONE. This is intended to increase compatibility between mods, not limit them. Download the Skeleton and extract to the Oblivion folder. If prompted whether or not to copy and replace, REPLACE!!! Permissions: You 100% have my full permission to use this skeleton to create custom clothing, animations, etc. In fact I'm practically begging you to do so. I am actually attempting to learn animation just for this skeleton. So please, use it, publish it, and enjoy.